Ensemble Interface enjoys a long-term partnership with choreographer Kurt Dreyer. Kurt has been staging projects such as Limbo Lander (Darmstadt Ferienkurse – Wien Modern, 2014) and Diabelli Machines #5 (Orpheus Institute Ghent, 2016), and collaborating as stage coach in many other performances, including Zeitgewoben (Dampfzentrale Bern, 2012) and Rules of love (Dampfzentrale Bern, 2015). 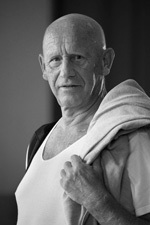 Kurt Dreyer, Lucerne – Formed in classical and contemporary dance techniques, Tai Chi Chuan, Alexander Technique and choreography in Lausanne and London. Freelance pedagogue since 1974 as well as tutor at different music academies – Berne, Basel, Lucerne and University of Berne. Guest teaching in Europe and Asia in rhythmical bodywork, placement, stage orientated movement for musicians and singers, dance technique, improvisation and scenic structuring. Numerous dance pieces, performances in museums and galleries as well as stage directions.